Prime Minister Stephen Harper defended the governing Conservatives on Thursday after two separate rulings found they need to provide better answers to the House of Commons. House Speaker Peter Milliken ruled Wednesday there's a case against the government for breach of privilege after it refused to hand over detailed cost estimates of its anti-crime agenda. He also found a minister may have misled MPs, and the opposition was right to keep pursuing the issue. Both rulings reasserted Parliament's authority in being able to call for documents and other information MPs feel they need to do their jobs. Harper said he thought the government had provided enough information to comply with Liberal MP Scott Brison's request. "We have debates in Parliament all the time," Harper said in Toronto. "The Speaker rules. You win some, you lose some. "If you lose, you comply, and that's what we'll do. … The Speaker says the information's not adequate (so) we'll go back and look at what additional information we have to provide." 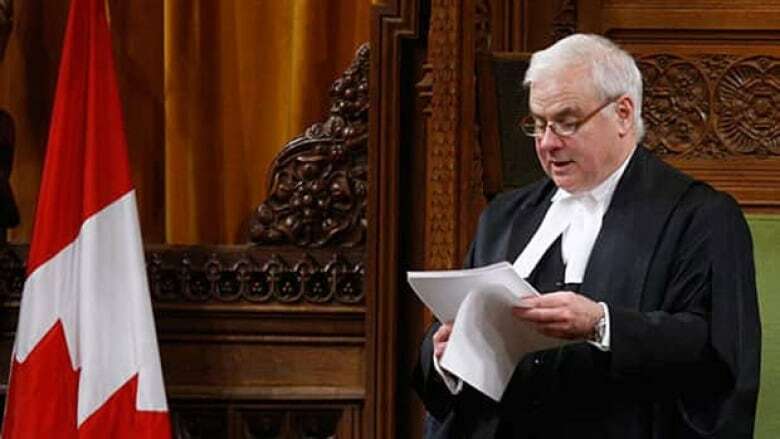 Milliken ruled there was a "prima facie breach of privilege" — in other words, enough evidence to send two separate motions back to MPs to decide the next step. He was ruling on two Liberal motions. One complained the government was refusing to give financial information to the House and the other alleged International Co-operation Minister Bev Oda may have misled a Commons committee. In the first case, Brison had argued the government breached his parliamentary privilege by not handing over documents detailing the costs of its anti-crime initiatives. Milliken referred to previous rulings, saying the House has never set a limit on its powers to produce documents and the rules are categorical in repeatedly asserting the powers of the House. "There's no doubt the order to produce documents is not being fully complied with, and this is a serious matter that goes to the heart of the House's undoubted role in holding the government to account," he said. The government and opposition have been duking it out over the issue, with the government maintaining there will be no major costs associated with its tougher sentencing legislation but providing few numbers to back that up. After the Speaker's ruling, the House voted to send the matter back to committee, asking it to report back by March 21, the day before the federal budget. Brison says the government's refusal to hand over the financial information is an affront to Parliament and an insult to Canadians. In the Oda case, Opposition MPs accused her of misleading a parliamentary committee when she said she didn't know who inserted the word "not" into a signed document. The insertion changed the meaning of a memo signed by top CIDA staff, denying $7 million in funding for aid organization Kairos. Oda later said she had instructed her staff to insert the word. Milliken said he considered the fact Oda was subject to harsh public criticism but ruled there was enough doubt about what happened to warrant more discussion. "At the very least, it can be said that (Oda's statements) caused confusion," Milliken said. "The confusion persists." With the rulings, the Liberals could try to find Oda or the government in contempt of Parliament and try to call for a vote of confidence. But Liberals say their understanding is the Speaker would not allow a confidence motion on either point of privilege. P.O.V. : Do the Speaker's rulings change how you feel about the Canadian government? A spokesman for the prime minister said the government will review the ruling on the financial information and decide whether it can release anything further. The government is arguing cabinet confidence prevents it from disclosing more than it has. Dimitri Soudas also said he's confident a fair hearing will vindicate Oda's position. "It is clear that the Speaker ruled only that there is continuing confusion — there was no finding whatsoever against Minister Oda," Soudas said in an email. Oda rose in the House to talk about Kairos for the first time since Feb. 14. She has answered questions since then, but Government House Leader John Baird has answered the questions about the inserted "not." "From the ruling made, it has been indicated that there appears to be confusion regarding the facts," Oda said. "I believe I have been clear. I accept the ruling and look forward to provide all the clarity needed, truthfully and respectfully, at committee." Opposition MPs on the foreign affairs committee, led by Liberal MP John McKay, argued Oda misled the committee over her responses to questions about Kairos funding last December. Oda told the committee she couldn't remember whether she had signed the memo that had, prior to the insertion of the unexplained "not," sought a funding renewal for Kairos. Lukiwski said the document with the "not" inserted was meant only to communicate the minister’s decision. He said it wasn’t intended to be made public. The party later distributed a memo that said Oda was out of town when the decision was due and her staff inserted the "not" at her instruction and used a machine called an Autopen — which mimics her signature — to sign the document. Conservative MPs filed a supplementary report to the foreign affairs committee report, saying they don't agree Oda was in breach of privilege or she intended to mislead the committee. "The minister does understand that she could have more clearly communicated the purpose and intent of why and how her office implemented her direction, and she has apologized to the House of Commons for how this issue has been handled," the Conservative response read. "In that statement, she clearly said that it was never her intention to mislead either the House of Commons or the committee."